5 Ways To Hone Your Problem-Solving Skills to Become An Expert In Your Field. Each day we all have to make decisions and we all face problems that need solving. Whether the issue is big or small, we all set goals for ourselves, face challenges and strive to overcome them. When you help others overcome their problems by offering fast-track solutions, your value as an expert receives an automatic boost. It’s important to realize that being a problem solver isn’t just an ability – it’s a whole mindset, one that drives people to bring out the best in themselves – so be very clear on your direction. Problem solving is easy when you know how to approach it effectively. Your goal as an expert should be to help others turn problem solving into a habit so that they feel more empowered when future problems arise. You will be most remembered by the problems you solve for your clients with your expertise. You deal with problems that might otherwise seem huge, overwhelming, or complex to others. Don’t take your knowledge and expertise for granted – your way of looking at things and your way of thinking is unique and it is based upon your own experiences, failures, and successes. That’s what your clients pay for. You offer them a shortcut to problem solving. Here are five steps to improving your problem-solving skills and become an expert in your field! Define each problem in detail before trying to solve it. Take time to understand the problem, understand the criteria for a good decision, and generate some good options. Offer one or two firm solutions. Offering too many suggestions will only confuse your client and allow him to become indecisive. Be very clear on the direction you offer with your solution. Prioritize your client’s action steps to help avoid overwhelm. If your client agrees to take action, ask him to relax and focus on moving forward. Be sure that the action steps requested are doable and achievable in a timely manner. Implement a step-by-step plan of action. Provide a checklist and mark off each item as it is completed so that others feel that they are achieving their goals and moving away from problems, obstacles and challenges as they take action steps. Look for more ways to improve upon the problem-solving idea to avoid future problems. Continue to perfect your problem-solving skills and use them for continuous improvement initiatives to serve your clients’ needs. The more effectively you solve problems, the more value you create as the go-to authority. Solving problems increases your value as an expert and empowers those around you to think critically as well. 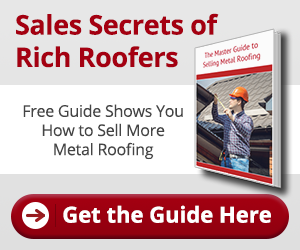 Be encouraged to become an expert in your field, and take your roofing business to the next level! When it comes to supplying and supporting metal roofing contractors in Miami, nobody comes close to Metal Master Shop. Call us today at (305) 547-9815 or visit us online at www.MetalMasterShop.com.